Eng. Hoda Dahroug (National Projects Director Egypt ICT Trust Fund - Acting Head of the Central Division for Community Development) and Eng. Yasser Kazem (ELCC Director) attended the first phase completion Celebration of the trainees of” improving the technical skill of the teachers working in the governmental sector initiative” at Cairo University, Monday, 26/02/2018. 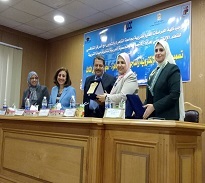 As part of its efforts to disseminate the culture of e-learning, enhance Egyptian youth skills and support the use of ICT in education, ELCC launched an initiative to improve the technical skills of the teachers working in the governmental sector to help them produce e-content according to the international development standards and specifications. The initiative was launched during the inauguration of the annual “e-Learning and Educational Technology” conference, organized by the Faculty of Graduate Studies for Education in July. The initiative was launched in cooperation with the Faculty of Graduate Studies for Education, Cairo University, to train 500 teachers and faculty staff in the field of education technology and improve their technical competences during 2017/2018, through delivering training courses on creating digital educational content using Articulate Storyline. ELCC training team conducted 12 training courses for selected candidates from July 24 to January 2018. 132 teachers and faculty members were trained. Each group of trainees submitted their graduation project on developing a in one of the subjects they teach.